Deep State #1 has proven to be quite a hit amongst the comic book readers out there, as the first issue has sold out at the distributor level. What does that mean? Well, it means excitement and elation for Justin Jordan and Ariela Kristantine. It means more work for BOOM! Studios, seeing as how they have to rush a second printing to stores. And it means another chance for readers to get on the work most recently garnering attention as a television drama with 20th Century Fox TV. In Deep State, John Harrow doesn’t exist, and his job is to make sure that other things don’t exist, too. At any given time, the government is running dozens of black book operations, experiments that aren’t on any official record and are never acknowledged to exist. Some of these are innocuous. Some of them are monstrous beyond reason. And most of the time, they go as expected and the public is never the wiser. Most of the time. John Harrow’s job is to handle them when things go wrong, and do anything to make sure the government’s secrets stay just that—secret. Deep State #1 second print ships with a modified cover by series cover artist Matt Taylor and carries a retail price of $3.99 with a Diamond Code of OCT148207. Final orders close for retailers on December 1st and it's anticipated to be in stores on December 17th. Comic book fans should bear in mind that first printings of Deep State #1 may still be found at the local comic shop nearest you. November 25, 2014 - Los Angeles, CA - Award-winning publisher BOOM! 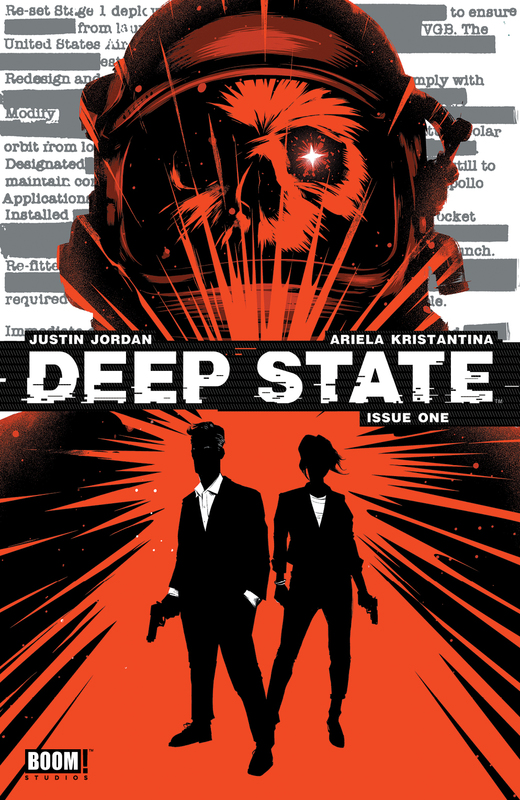 Studios is pleased to announce that Deep State #1, the new conspiracy-driven series from Justin Jordan (Spread, The Strange Talent of Luther Strode) and artist Ariela Kristantina (Death of Wolverine), has sold out at the distributor level. The publisher has rushed to a second printing. As announced on Deadline.com, the publisher has also sold the rights for the series as a television drama, as part of its first-look deal with 20th Century Fox TV, in a collaboration with producer Howard Gordon’s (Homeland, Tyrant) Teakwood Lane. Comic book fans should bear in mind that first printings of Deep State #1 may still be found at the local comic shop nearest you. Not sure where to find your nearest comic retailer? Use comicshoplocator.com or findacomicshop.com to find one! Deep State #1 second print ships with a modified cover by series cover artist Matt Taylor and carries a retail price of $3.99 with a Diamond Code of OCT148207. Final orders close for retailers on December 1st. It is anticipated to be in stores on December 17th.